Hailing from a long line of Wakandan kings, T'Challa has become the newest Black Panther. Donning the vibranium infused panther costume, Black Panther must find the delicate balance between leading the people of Wakanda, fighting alongside the Avengers, and keeping his love life in check. Despite making his first appearance in 1966’s Fantastic Four #52, Black Panther had never starred in a movie until 2016’s Captain America: Civil War. Since then, fans have been wondering – who is this superhero and where does he get his power? Read on for record sales and minimum values of the key issues! 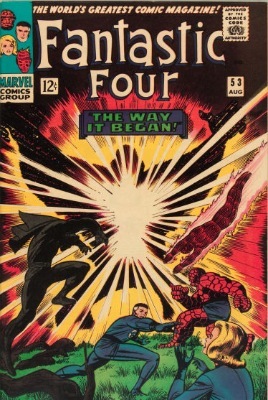 Fantastic Four #52 is one of our 100 Hot Comics. Click to find out why! Not only is Fantastic Four #52 the first appearance of Black Panther, it’s also the debut of America’s first black superhero. So how did Black Panther and Fantastic Four meet? Black Panther invites the team to his home country of Wakanda to test their powers. He easily defeats them individually, but when they put their powers together, F4 wins. This book has spiked rapidly in value due to the recent introduction of Black Panther into the Marvel Cinematic Universe. Click to have yours appraised. Thousands of years ago, a vibranium-rich meteorite crashed on Wakanda. In modern day, the meteorite is found and the vibranium is used for great technological advancements. Making his first appearance in Fantastic Four #53, Ulysses Klaw is Black Panther’s archenemy, having invaded Wakanda and murdering Black Panther’s father, all in his crazed search for Vibranium. 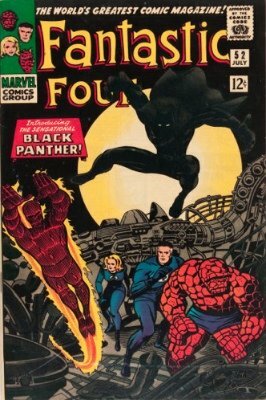 Set early in Black Panther comic book origins, Klaw’s first appearance and T'Challa's second is appreciating in value. One key Black Panther Marvel comic book to watch is Avengers #52, in which Black Panther joins the Avengers. 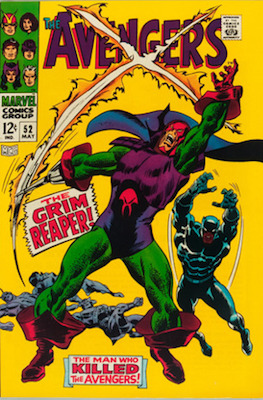 Avengers #52 is also the first appearance of Grim Reaper. Coming to the aid of the Avengers after Grim Reaper has "killed" them, Black Panther revives the heroes and is invited to join the group. Having spent some time with the Avengers in America, Black Panther is getting homesick. Revealing his origin story in Avengers #87, Black Panther details the death of his father, his destiny as Wakanda’s leader, and questions whether he should leave the Avengers and return home. 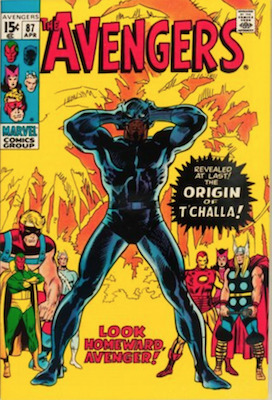 Avengers #87 is one of the most valuable Black Panther Marvel comic books. Nearly 10 years after his first appearance, T’Challa got his own Black Panther comic book - Jungle Action. Besides Klaw, Black Panther’s other notorious enemy is Erik Kill-Monger, a native Wakandan who was exiled after helping Klaw invade the country. 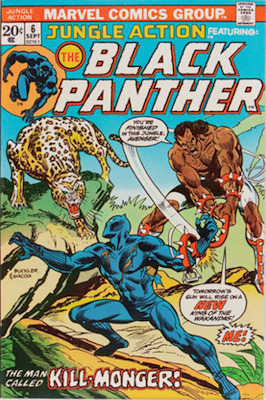 Erik Kill-Monger’s first Black Panther comic book appearance is Jungle Action #6 (1973). 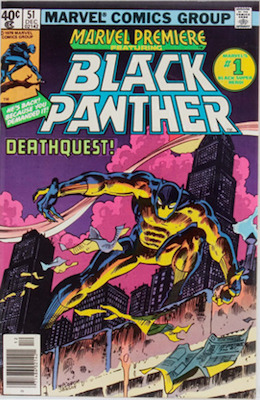 While not as valuable as other first appearances, this Black Panther comic book is a must-own for any collector. In 1977, Jungle Action was renamed to the more fitting Black Panther. 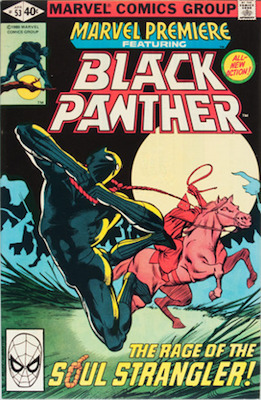 Written and illustrated by Jack Kirby, the Black Panther series continues T’Challa’s adventures in his home country, having left the Avengers. 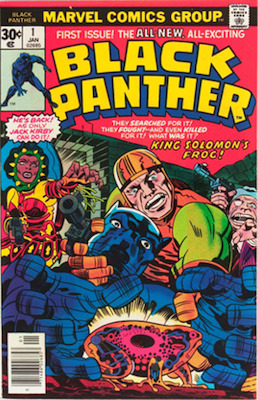 Black Panther #1 is a highly collectible Black Panther comic book, especially because of Jack Kirby’s involvement. 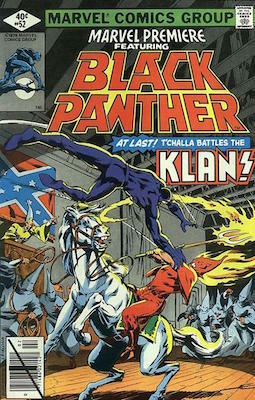 Volume 1 of the Black Panther Marvel comics series was cancelled after only 15 issues, but the story of T'Challa was far from over. Continuing his fight against the Ku Klux Klan and those who defile Wakanda, Marvel Premiere #51 - #53 marked the end of Black Panther’s story for several years. Use the button below to request a FREE appraisal of any of the above comics, or your entire collection! T'Challa has worked alongside everybody from the Avengers to Spider-Man. The super-team featured T'Challa at many times over the years. Find out values here. Find out which appearances of Black Widow are worth serious money. The mightiest superhero of them all: some mighty valuable comic books too! Whenever You Want to Appraise or Sell Comic Books, Talk to Us!